In addition to MODEX’s 800 exhibits, the MODEX Supply Chain Conference will include nearly 150 complimentary educational sessions outlining leading trends, best practices and state-of-the-art equipment and technology solutions. MODEX is partnering with Supply Chain & Transportation USA to deliver this one-of-a-kind, end-to-end supply chain educational experience. This keynote will global commerce and his perspective on future supply chain issues, trends and technologies essential to competitiveness. The keynote will include a shipper’s panel to examine supply chain challenges and opportunities for advanced manufacturing companies. In this keynote, Lee Scott will detail how to build a supply chain that is a market differentiator. Hear what it takes to match performance to a company’s needs and gain insight on how to cope with rapid change in the battle to deliver products to consumers at the lowest prices. Scott Sopher will join George W. Prest in presenting the findings of the new industry report from MHI. The report will focus on hot-button industry trends impacting manufacturing and the supply chain. 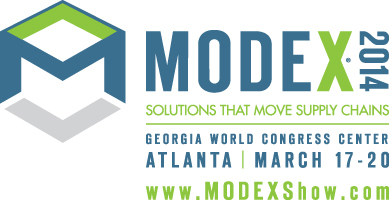 MODEX will be held March 17-20, 2014 in Atlanta’s Georgia World Congress Center. Admission to the exhibits and the conference sessions is free to all registered attendees. Visit MODEXShow.com to learn more and register to attend.